At the end of March, the Cinemateca Portuguesa-Museu do Cinema hosted the second partner meeting for CINARTS, the fourth European Film Education project conducted by Cineteca di Bologna and co-funded by Creative Europe. The project is developed with Cinemateca Portuguesa, Hungarian Film Fund, CINEMATEK, Les enfants de cinéma and BAM! Strategie Culturali. One of the biggest film parties in the world, which screened nearly 500 titles last year, is coming back for its 33rd edition, taking place this year between 22nd and 30th June. Famous for its legendary evening screenings in Piazza Maggiore, the festival recently decided to add an extra day during only one cinema operates, showing the best of that year. (English) Please complete the NEMOSINE survey! DFF – Deutsches Filminstitut & Filmmuseum and Filmoteca Valenciana – IVC are partners the EU project NEMOSINE, which aims to set new standards for the preservation of audiovisual heritage by developing innovative “smart packages”. To get an overview of current archival preservation conditions, could you please answer the following questions: Under what conditions do you store and preserve your collections? Which packaging / cans do you prefer? How satisfied are you with the existing solutions? What requirements do you think a « smart package » should meet? Completing the seven pages of the survey will take about one hour. You can save and pause at any time (just click on the button at the bottom of the page). Please answer the questions to the best of your knowledge. As a potential user of the innovative cans your feedback is important to us. Your answers will be treated confidentially. Deadline is 20 March 2019. If you have any questions, please do not hesitate to contact us. As part of an initiative funded last year under the European Year of Cultural Heritage, the European Commission is gathering proposals for organising a series of at least 5 screenings between May–September this year. 1. The screening must take place in a culturally important location. The venue could be a cultural institution or heritage site which already hosts screening events (so that they have all the equipment and experience with handling them). The screenings could take place indoors or in an open air location. The institution managing the venue should be willing to take the bulk of responsibility for the event (in collaboration with the local film heritage institution, the Creative Europe MEDIA desks, and the contractor of the European Commission). 2. The screening may take place during local celebrations, especially linked to heritage (eg. the 100th anniversary etc.). The screening may be followed or opened by a networking cocktail, and/or discussion with a film/cultural historian (depending on the context). Of course, the bigger the outreach and audience of the screening, the better. 3. The heritage film to be screened has to be a non-national European film. It will be a film of your choice as your knowledge of the audience’s preferences will be relied on. Proposals for different venues and concepts for these events are now being gathered. Concrete suggestions of possible venues, possible dates and a rough estimation of costs are needed. Please send questions and proposals directly to Ms Irina Sofletea (Irina.SOFLETEA@ec.europa.eu). Deadline for sending in proposals is 20 March 2019. A new name, a new brand identity, a new study center on Eschersheimer Landstrasse, innovative exhibitions and other exciting projects: 2019 will be a special year for an institution that goes back, at its roots, to the Deutsches Institut for Filmkunde (DIF), which was founded 70 years ago on 13 April 1949. Say hello to the new DFF – Deutsches Filminstitut & Filmmuseum. 2018, the first year for new director Ellen Harrington, was a successful one, with 201,000 visitors in the Museum on the Schaumainkai alone, and 365,000 visitors worldwide at our touring exhibitions and film programs. Right at the beginning, Harrington initiated a series of processes to analyze the impact of the institution. In addition to extensive visitor surveys, a working group started in February to draft a new mission statement; the group also developed the new name that presents this international film heritage institution as a unified entity- the DFF – Deutsches Filminstitut & Filmmuseum. The new names stands, from now on, for the integrated organization that has emerged from the joining of the former DIF and the Deutsches (German) Film Museum, which opened in 1984. After the renaming of the Deutsches Institut für Filmkunde to « Deutsches Filminstitut » in 1998, the acronym DIF did not fit any longer, though it remained in use. With the merger of the Deutsches Filminstitut and the Deutsches Filmmuseum in 2006, its use repeatedly caused confusion. This is now a thing of the past. In 2019, the year of the 70th birthday of the institution, the DFF presents itself as a unified whole. a fresh color concept, the Offenbach-based graphic design firm Urban Media Project has successfully implemented this requirement. Their clever brand design, which focuses on projection as a link between the analogue past and the digital present and future, will be widely presented in the coming weeks and help to advance the repositioning of the institution. The tag line « Everything is film, » derived from the mission statement, punctuates the brand. It expresses the belief, from the point of view of our DFF experts, that ‘film’ encompasses and communicates the essential things in life and art – it creates a ‘cinematic world’ which touches our emotions, evokes our dreams, and shares visual beauty or even ugliness. Film inspires our imaginations with themes and images that entertain, shock and challenge us as human beings. Everything we see, hear and feel can remind us of a film, and serve as the inspiration for a new one. That is why, for us: Everything is film! An appealing, responsive new website is currently being created, which will go online in the Spring; there visitors can intuitively discover the full range of DFF offers. Naturally, this will also include online ticketing for cinema-goers. The film installation ‘70 Years in 70 Minutes,’ opening on 25 March, presents German film since 1949 in a curated projection experience, and gives the starting signal for the celebrations marking the 70th anniversary of the house, which culminate in a ceremony with Minister of State Monika Grütters on Monday, 20 May. On the same day, the new DFF – Fassbinder Center, Frankfurt, will be opened – another highlight of the anniversary year. In the new study center on Eschersheimer Landstraße, the DFF will be able to concentrate its many collections, including the estate of Rainer Werner Fassbinder, which was taken over in 2018, and make them accessible to film experts and the public for research purposes. Shortly thereafter, on 3 June, ‘Digital Revolution,’ an interactive exhibition dealing with the creative possibilities digitalization offers the arts will open, with a focus, of course, on the medium of film. The international artist Maximilian Schell, whose personal collection the DFF took over two years ago, is the subject of a major autumn exhibition that combines multimedia elements with scenic installations and invites visitors to immerse themselves in Schell’s artistic cosmos, including his interactions with many of the leading creatives of the 20th century across many fields. First up, from February 1, there will be a visitor-oriented innovation in the opening hours: In future, the museum will change its evening schedule, and will be open until 8 p.m. on Fridays instead of Wednesdays. Claudia Cardinale (Once Upon a Time in the West, 8 ½, The Leopard), Klaus Maria Brandauer (Mephisto, Colonel Redl, Out of Africa) and Jean-Marc Barr (The Big Blue), as well as Katinka Farago, Ingmar Bergman’s legendary – Hungarian-born – colleague, are all coming to Budapest between 4–9 September. 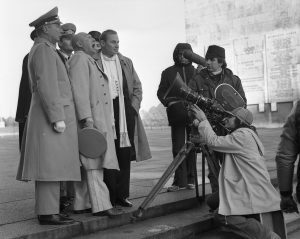 Hungarian film classics, 4K restored by the Film Archive and Hungarian Filmlab will be screened along with masterpieces restored by other major European archives. This is the first opportunity to see the magnificently restored Oscar-winning Mephisto, Zoltán Fábri’s and Sándor Sára’s films, Hungarian animations, beautiful documentaries on such defining female characters of the film industry as Hedy Lamarr, the select of Cannes Classics 2018 programme is on show. We can also learn about which movies inspired Wes Anderson to make The Grand Budapest Hotel. Alain Bergala, Jean-Michel Frodon, Gian Luca Farinelli and Madeleine Probst will hold multidisciplinary discussions with film experts, teachers, critics and educators, with the aim of establishing quality criteria for Film Education at a European level. They will highlight, through practical examples and best practices, the important role played by Film Heritage in our cultural background, and how it contributes to making young audiences more attentive and aware when it comes to dealing with audio-visual contents. The conference is co-organised by CinEd and FLICK; European projects co-financed by the MEDIA sub-programme of Creative Europe. To read the full program of the conference, please click here. Workshop promoted by Cinematek (Cinémathèque Royale de Belgique, Bruxelles), MoMA – The Museum of Modern Art, New York and supported by FIAF (International Federation of Film Archives) and IBC (Istituto per i beni artistici culturali e naturali della Regione Emilia-Romagna). Why is interoperability so difficult for film archives to achieve? Efforts along these lines have often resulted in complete failure or imperfect results. What if we just haven’t had the right solution until now? Isn’t it worth taking a look if it means your institution can finally and more completely fulfill its goal to provide access to its collections, both film and film-related materials? Linked Open Data may be the way forward and this workshop will present ideas, arguments, and concrete developments that should help you understand its potential as well as the resources available to help you start using it. Because ACE had to close down the secretariat in Frankfurt it became necessary to move the ACE website to a new home from DIF’s servers. Since the website was running some really old software it also needed a technical overhaul. This website is now hosted on a server in Amazon’s cloud and sports a new layout which is responsive so it should work nicely on mobile devices too. The content is the same with only some minor corrections. Once we’re running in full speed we hope to add some new stuff – especially preparing for the GA in Bologna. That is set to take place on 27 June at 2 p.m., save the date! Reports on any anomalies of the new site are welcome. Please send any comments via email to me at mikko.kuutti@kavi.fi. Get in touch with your National Contact Point for further information.